Questions like the one below are getting more and more common on SO. 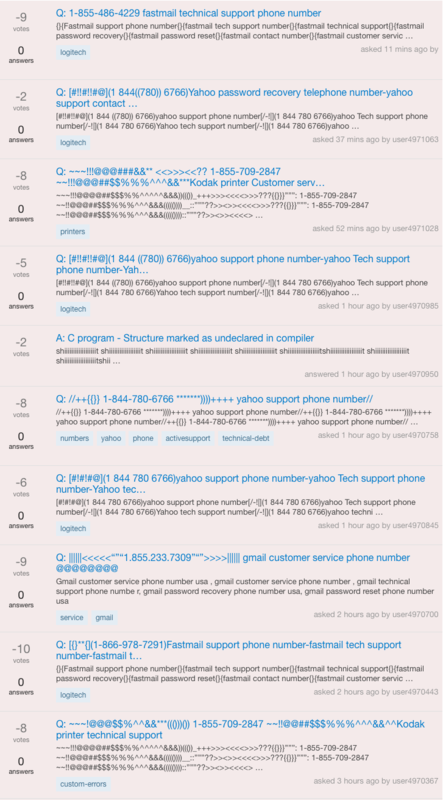 Yes, we get rid of them quickly with spam flags, but it seems like there's got to be a heuristic we can use to automatically prevent their being posted, such as not allowing a new account to post a question containing the word "support" 20+ times in the text (or to just silently fail to post it). Is that feasible? This is probably just me being silly, I know we'd be at least a couple of orders of magnitude more spam than we do if the SE team weren't already on it, but I thought I'd flag up the pattern. As a first step you could require users creating a new post (either question or answer) with less than n reputation to enter a captcha (or pass some other "Prove you're a human" test) before being permitted to submit the post (for some reasonably small value of n but not too small). As a next step, perform a statistical analysis on the post to count word occurrences for users with less than m reputation (where m may or may not be equal to n above). This can be compared to historic patterns of both spam and legitimate questions and answers. If the submission falls too far outside the patterns normally associated with legitimate posts, then have the user respond to a captcha before permitting the post. This should at least cut down on the spam making human handling a more manageable task. But I also like the idea of silently blocking the spam. It's possibly more complicated than it seems. If there's a whole lot of accounts from one spambot, they could easily see that their spam is getting blocked. Instead, let everyone with the spam flag on their account see all the spam, but no one without the spam flag can see it. Usually that would be used for like an exclusive club, but in this case it's used in reverse. Not the answer you're looking for? Browse other questions tagged feature-request asking-questions spam . Is there a pre-filter for questions posted by users with < ~10 rep? How come spam user can repost spam?